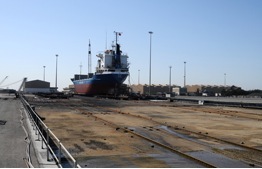 The Site is located at ASRY Ship Yard located in the Kingdom of Bahrain. The new Marine Slipway is located within the ASRY Basin, north of floating dock. Location was chosen for many reasons including the fact that the site is already reclaimed. Additionally, the location is technically suitable as it is considered relatively sheltered from wave's disturbances. The Project consists of construction of a marine facility to launch vessels or to pull / haul ashore vessels to take berths and have essential maintenance or repair works. The Slipway comprises of track supports on reinforced concrete beams with bored piles and the vessels are docked on cradles running on the rails and there is a winch system(s) supported by capstans and sheave blocks for up-hauling / down-hauling vessels. With this arrangement of construction, ASRY can accommodate four vessels at one time using the twin slipways. The way the new slipways have been arranged is of the vertical curve design, allowing two vessels to be simultaneously berthed, end-to-end on each slipway. Both slipways are in parallel with a total width of the slipway of 64 meters. The overall standing area for the vessels in now 275 meters. The maximum length of vessels will be 140 meters and the maximum breadth 20 meters with a displacement of 5,000 tones maximum per vessel.